On a balmy summer afternoon, a select few enjoyed a lunch with meats and fish of their choice cooked on a large fire-pit which lit quickly and burned well, served with salads and puds and plenty of wines beers and soft drinks. 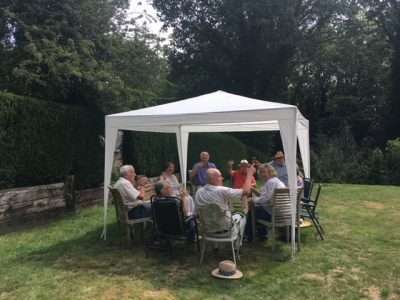 We all managed to sit down to eat together, using the club gazebo which was erected – a useful trial run before it is put to use at the Croquet demonstration at Penshurst Place on Bank Holiday Monday. Thanks to John Greenwood for help in putting it up. Garden games were neglected in favour of a lively debate on the use of bisques! The argument in favour of their use to encourage less experienced – and less able players seemed to win the day! Fixing the date for social events is always a gamble – and this year the date chosen for a BBQ at Hungershall Park was an unfortunate one as so many members were engaged with family activities or other commitments. Any ideas about the timing of the social events for club members and of the form these events might take would be welcome – please just speak to any Committee member with your thoughts!